When I first thought of doing this blog, I planned on reviewing books based on a monthly theme–reviewing only Watson books in July, for example. With the rapid influx of new pastiche, I’ve had to scrap this plan just to keep up, but that doesn’t mean we can’t have the occasional theme month. And since it’s February, what better theme to use than…romance? I know, I know, a few of you are about to navigate away. Not everyone likes the idea of giving Sherlock Holmes a love life. 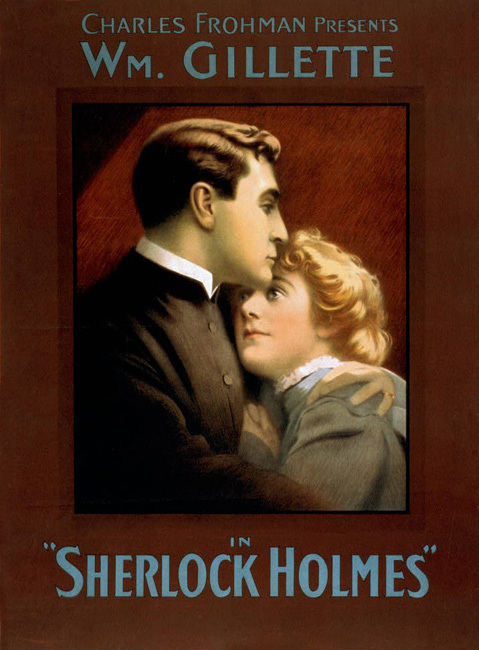 But ever since Doyle told William Gillette that he could “marry him, murder him, or do anything you like to him,” writers have been taking him at his word and producing quite a lot of Holmesian hook-ups. So many, in fact, that it was hard to choose among them, and I’ve had to leave three of my favorites for another day. This February, we’ll look at a relatively new work, an older one by an established writer and, finally, a book with a March sequel. Barefoot in Baker Street, Walters wants the reader to know, is not a Sherlock Holmes novel. Rather, it is a novel in which Sherlock Holmes appears. The story actually belongs to Red, a young woman fighting to rise above her workhouse origins. Red is not another Watson, recounting a Holmes adventure through her own eyes; she’s got a lot more to say in this first-person memoir than that. We never know what Red’s mother named her. She doesn’t know, herself. Like many young couples, her parents come to London seeking opportunities denied them in their rural county and, like many, fail to find them. Red’s father dies in a railway accident, leaving her mother to take refuge in the massive, infamous Whitechapel-Spitalfields Union Workhouse. There, she dies giving birth, leaving her daughter to a hardscrabble childhood in which she’s named for her hair. Walters doesn’t shrink from painting the realities of workhouse existence. Because the novel is written as an older woman’s memoir, some details are less graphic than they might have been, but they’re no less horrific. A highly intelligent but strong-willed, emotional child, Red is too volatile to stay in an orphanage; thrown out into the East End streets, she returns to the workhouse. There she endures rudimentary education, religious and domestic training, and works at pulling apart tar rope until bits of oakum are permanently embedded in her skin. 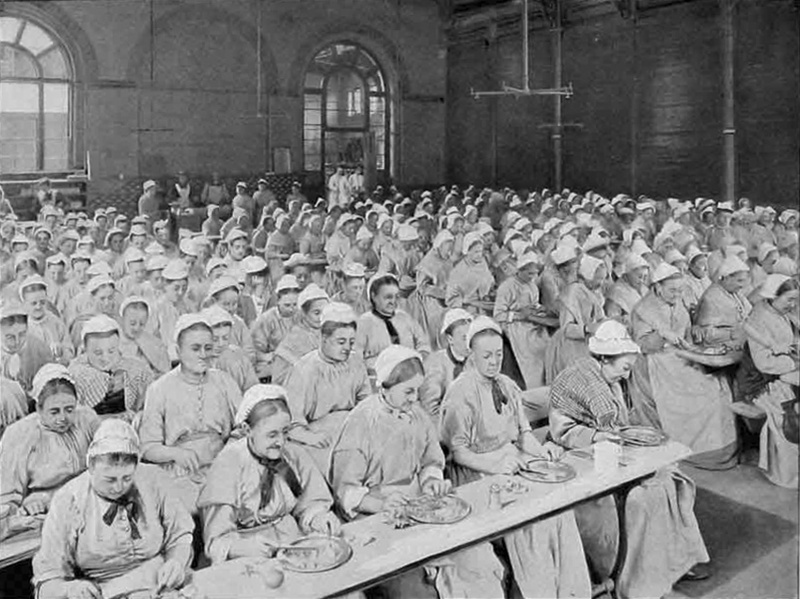 Life at the Union Workhouse is physically brutal, disease-laden and humiliating but, as Red points out, the fact that she has never known any other world makes it easier for her to survive the harsh conditions which defeat many workhouse denizens. She is strong and able to fend for herself, which she does ruthlessly one night after Union’s schoolmaster rapes her. After killing the manager who tries to block her escape, she grabs the master’s money and flees, taking with her Jude, a young boy she once saved from a beating, who is her only friend in the world. Unable to return to the workhouse and running out of stolen money, Red and Jude do what many street children did out of necessity and affiliate themselves with a gang–in this case, the Dean Street Gang, led by one Wiggins. Yes, that Wiggins, and it’s through his “moonlighting” as a Baker Street Irregular that teen-aged Red first comes into contact with Sherlock Holmes. He makes a definite impression, one she doesn’t forget as she’s pulled even further into the London underworld of prostitution, thieving, gambling and alcoholism. Her intelligence and physical strength serve her well, and she carves out a successful, if legally precarious, life for herself and Jude. It’s only a matter of time before she falls into the crosshairs of the Napoleon of Crime, a pivotal moment which changes her life forever. For the past two weeks, I’ve debated what to do at this point of the review. A summary should, well, be a summary and give you, the prospective reader, an idea of the book’s major plot points. It should not, however, contain spoilers, and if I go very much further, spoilers will appear one after another, like dominos in reverse. So let me just echo Walters’ description: Barefoot on Baker Street is the story of a woman’s life, and on her journey, Red reaches some very familiar female landmarks. While our lives may not be quite as adventurous or involve plots to, well, rule the world, most of us have encountered the horrible boyfriend, the passionate fling and, hopefully, the stable, mature relationship. Never content with life as it is, and despite tremendous loss, Red continues to grow throughout the novel until one day the savage little girl from the workhouse is only a memory. Barefoot on Baker Street is Charlotte Anne Walters’ first novel, and the seven years’ of work she devoted to it have had impressive results. * The first half of the book shifts seamlessly back and forth between Red’s early days and her life in Moriarty’s household. ** The memoir format makes for quite of bit of “telling” in place of “showing,” at least in the first few chapters, but the dramatic flow of events minimize the impact and keep the reader’s attention. Many of the confrontational scenes–and the romantic ones–are electric, although I did find a couple to be slightly overwrought. As everyone seems to collectively lose their minds directly after Moran is arrested in a retelling of “The Empty House,” for example, I found myself wanting to reach through the pages, shake a few people (Watson, I’m looking at you), and tell them all to calm down. It’s common for main characters in first novels to be “Mary Sues,” perfect in every way, even their (minimal) flaws somehow adorable. Fiction, romantic fiction in particular, also suffers from a preponderance of feisty heroines, to the point that they’ve become a stereotype. Walters avoids both of these pitfalls. Red is a fully realized woman, more flawed than not, who must do some difficult emotional work to mature. Because she’s so vividly alive, she avoids one of the fates that commonly befall new pastiche characters; the reader cares about her, and doesn’t skip through her story just to get to more Holmes and Watson. The other major characters are similarly well-drawn, Moriarty and Holmes in particular. Walters has an interesting and, I think, believable take on how both men think, and the mental and emotional challenges they face. Watson is less clearly envisioned and sometimes seems out of character, but not fatally so, while Mycroft is treated with care and complexity. As supporting characters, Sebastian Moran, Jude, and Ronald (a new brother for Watson) fill their roles adequately. Again, I realize that some of you like your pastiche canon-straight. But if you’re adventurous, and open to allowing the Great Detective a little love, you’ll find Barefoot on Baker Street an exciting, engrossing adventure. Want to leave your own opinion? First comment wins a copy of this week’s book, or your choice of David Ruffle’s Sherlock Holmes and the Lyme Regis Horror, or a BSB coffee mug–any one of them a perfect Valentine’s Day gift! *Walters says she is currently working on a screenplay for Barefoot (which is quite visual and would lend itself well to the screen), and has several other books in the mental percolation stage. ** When I first bought Barefoot, I was so eager to read it, I did so on my phone. This was a mistake. While the shift in time periods during the first part of the book are very obvious in the printed copy, they’re not as distinct on a phone. I was very confused. In a new edition, separation marks might be useful. Barefoot on Baker Street is available from MX publishing, major online booksellers (for US readers) and in Waterstone’s and other brick-and-mortar stores in the UK. You can also purchase it from the Baker Street Babes’ Bookshop, here: http://www.bakerstreetbabesbookshop.com/category/Sherlock+Holmes+-+Female+Writers; profits go to support the BSB podcast (which, incidentally, interviewed Charlotte Walters for Episode 10). I shied away from buying this on the basis of the reviews on Amazon, but your review has certainly whetted my appetite to read it. I make it a practice never to read the Amazon reviews for a book I plan to review so…. *checks reviews*. Yeah. Honestly, some people are always going to knock a pastiche with romantic content; it’s just not their thing. But I think it’s telling that Phillip Jones, who is an acknowledged pastiche expert, gives “Barefoot” 5 stars. He’s definitely read enough to make an informed judgment. Also…you’re the first commenter! I take it you’d like the copy of “Barefoot”?